It’s that time of year again. I’ve been so busy with culinary classes and events that I’ll be lucky if I can post more than once a week from now until the end of the year. However, I’ll do my best to visit all my blogger friends and post comments on your blogs. In the meantime, I am still cooking! With Thanksgiving just 16 days away I thought I’d post a variation on the Thanksgiving Day turkey. Many of you will have a large gathering of family and friends while others an intimate gathering of just a few. So if you’re looking for an alternative to roasting a large turkey or doing something more creative than just a turkey breast – consider a Turkey Roulade. I make these all the time stuffing with whatever I’m in the mood for. The breast above is stuffed with spinach, shallots and roasted red peppers, while others I’ve stuffed with mushrooms; bread stuffing; wild rice, etc. Whatever sounds appetizing to you, works! Ask your butcher to bone and butterfly a turkey breast for you. You can request to take the skin off or leave it on. I have found leaving the skin on definitely makes for a juicier turkey. Opt to have the butcher separate the breasts making it easier to handle or leave the 2 halves connected, making one large roll. Have them flatten the breast 1/4 inch thick or do it yourself when you get home between to sheets of plastic wrap. Which ever way you decide to debone your turkey the stuffing and rolling are the same. Heat butter in a skillet and add shallots. Cook until softened. Add spinach briefly to heat up then turn off stove and mix in roasted red peppers. With the turkey opened up and laying flat, skin side down on a cutting board drizzle with salt and pepper. Then spread the spinach mixture over one side of the turkey being sure to leave about a 1-inch border all the way around. Then simply roll your turkey from one end of the breast to the other, tucking the sides in. Then cut your twine in about four 24″ pieces (if using the entire turkey – one whole breast – or cut into 12″ pieces if using 2 separate butterflied breasts), placing the center of each piece of twine under the seam of the turkey and tying it on top. Repeat with the other 3 pieces of twine spacing them evenly apart. Then cut a 5th piece longer than the other four to be tied the entire length of the turkey. This will insure that it will remain closed while cooking. Place in a roasting pan. If you like add about 1/2 cup of Marsala wine and 1 cup low sodium chicken broth to the bottom of the pan. Cover and bake at 350F until the internal temperature reaches 160F degrees. The whole rolled turkey breast it will take approximately 1 1/2 hours, while for two separate butterflied turkey breasts it will take approximately 45 minutes. At this point you can remove the turkey from the oven and let it rest for about 20 minutes. This will allow the juices to evenly get distributed. While resting the internal temperature of the turkey should rise to 165F-170F which is where you want it to be for eating. (Baste at least once during cooking with juices). While the turkey is resting (if desired) take 1 1/2 tbsp. of butter and melt in a saucepan. Once melted add the same amount of flour and cook with the butter until the flour reaches a golden brown. Then add the remaining liquid (Marsala Wine and chicken broth) from the turkey to the saucepan and cook over low heat until it thickens. Slice your turkey roulade and drizzle with the marsala wine sauce or other sauce. This is so delicious and moist you won’t believe you made it. Note: The Marsala Wine Sauce is nice and light and I’ve used this when I make the Turkey Roulade stuffed with mushrooms. However, a nice Roasted Red Pepper Sauce is also fantastic with this dish, which I prefer. I did not show this with a sauce since my husband and son requested it plain. Serve with all your favorite sides for a wonderful Thanksgiving meal. Delicious! I did a roulade for Christmas dinner last year – it was terrific! It was stuffed with regular stuffing, tho. I really like the lower-fat ingredients you used to stuff this one! Very nicely done, Vicki! Oh wow you sound very busy! Please take good care. 🙂 I’ve never tried making roulade before but it looks extra fancy and I definitely need to practice so I can impress my guests. Looks yummy, Vicki! Delicious. I do this with my venison all the time, but never thought to do it with turkey. 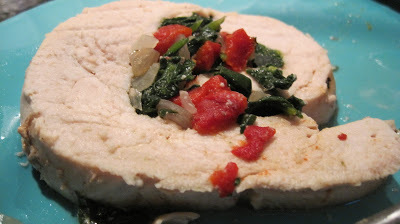 Ann – I love this version of a Turkey Roulade or stuffed with other veggies and/or grains of your liking. Drizzle with a sauce over the top and it’s perfect. Then make Dorie’s stuffed pumpkin on the side for your stuffing. That’s what I made with this meal. However, for my Thanksgiving dinner I’ll be stuffing a whole turkey since 1/2 the family likes dark meat. Roulades make a stunning presentation IMO and they really are easy to prepare. If you’ve never tried making a roulade you should, they’re so pretty and not difficult at all. I make them with turkey, beef tenderloin and salmon. In fact here is a video demo that I did on tv years ago making my Salmon Roulade. It will show you the steps. 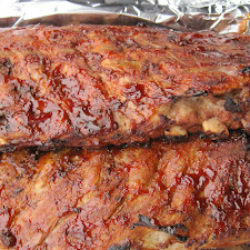 You can also make them with pork tenderloin or any large piece of meat that you can butterfly. I’ve never tried it with venison but I’m sure it would be fantastic. What do you stuff it with? MMMM, looks great. Nice combination of ingredients for the stuffing. Roasted tomatoes would be nice, too. (Maybe with some melty cheese? Sort of a weird take on turkey Cordon Bleu?) Anyway, nice post – thanks. what a fabulous dish! Both beautiful and yummy. I really need to make turkey more than once a year…and your roulade is a wonderful inspiration! wow nice combinations of ingredients! Yeah, me too. I won’t be able to post more than once a week (well I already skipped 2 weeks -haha). Man, I am so not in Thanksgiving mode – a simple yet thoughtful dish like this is really appealing to me. Kitchen Riffs – yes it would be wonderful with cheese. In fact I do something similar with chicken creating a cheese mix similar to Boursin and it’s to die for. In fact I made it last night. 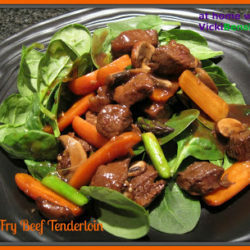 Thanks for the awesome recipe Vicki! This is such a nice alternative to the traditional turkey! @Lizzy – turkey is delicious IMO so long as you don’t overlook it. You should try it. @ Tanatha and Trix – I do hope you will try it. Making a roulade regardless of what you’re preparing is easy. If you can roll sushi you won’t have a problem. @ Dulce Dough – its a great alternative and so festive. If all you like is white meat then go i suggest trying this. It’s fantastic. Served with a glass (or two) or white wine… perfect! @Pegususlegend – you are so sweet Claudia. This is so simple to prepare, it just looks hard. If you have the butcher bone and butterfly the meat that’s the most difficult part. You can do it. If you want I’d be happy to hold your hand online and walk you through it. It truly makes a stunning presentation. @ Ayden – thank you for stopping by. I just checked out your site. Lots of great info. Yes, white wine would go great with the turkey roulade. This really sounds delicious and it is perfect for smaller families who want to enjoy turkey for the holiday. You asked about the cake. I don’t dislike it, but I don’t like to mislead people either. I’ve made the cake several times, but it is not a favorite of mine. It is, as I said, a nice cake, and it is seasonally appropriate. The cake has extensive comments on Epicurious website if you’d like other opinions. Thank you for your comments. I know what you’re talking about with the cake. I made a beautiful cake a while back with such mixed reviews. Either people love it or hate it. Somehow there’s no in between. I will check out those reviews. Thank you. I am glad you posted this dish despite your hectic schedule! Delicious post and I am going to try it soon. 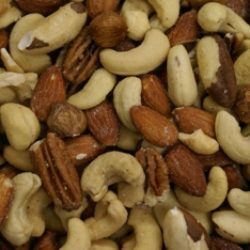 Easyfoodsmith – I hope you enjoy this dish. Thank you for your comments. Somehow I’ve never quite cooked with turkey coz I always find it a little dry. Looks like your roasted red pepper sauce is perfect with this dish. @ChopinandMysaucepan – if you cook it with the skin on it will remain very moist. The key is not to over cooked the turkey. If you have a temperature probe that you can leave in your turkey this would be ideal. Then take the turkey out when it reaches 160F degrees – cover and let stand for about 20 minutes and the temperature will raise to 165-170F degrees which is perfect for eating. Then it won’t be dry. Many people tend to over cook their turkey’s and then they taste like leather. A roasted red pepper sauce is wonderful on top or depending on what you stuff it with, make a coordinating sauce to go with it. 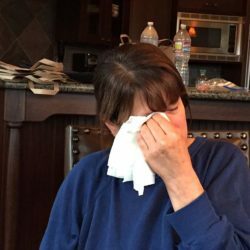 It was my honor to spot your wonderful blog through Ann’s space. i have never cooked turkey in this way but yes I did stuffed chicken breast by rolling and then slicing like the same way. 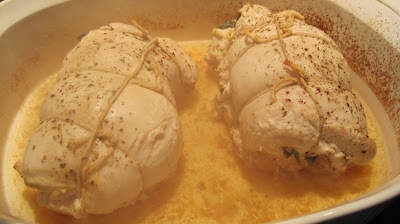 I bet your turkey roulade would taste much better cooked in that chicken broth and Marsala wine. I am following to get an experience of your culinary skills. Thank you Neetu, this is a delcious recipe. To keep the turkey even more moist cook it with the skin on. However, either way tastes great so long as you do not overcook it. Thank you for stopping by. I’ll be visiting you soon as well. Just had a beautiful drop of white wine from New Zealand with Salmon. Went down perfect.